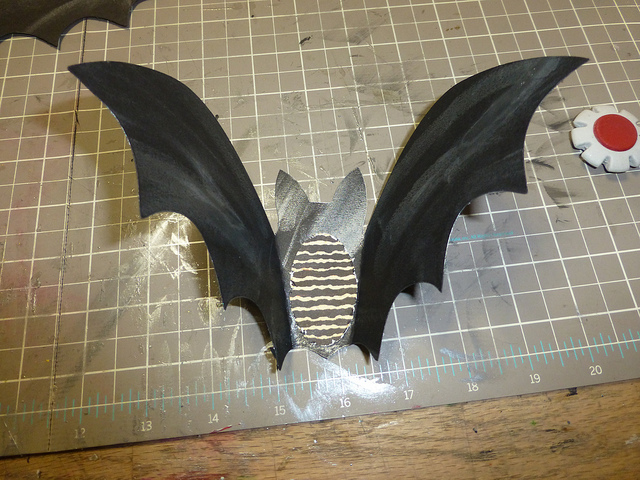 The Gentleman Crafter: Getting Batty! Thanks goes to Barb Engelking for finding a way to post files or at least links to files on blogger...Thanks So MUCH Barb! I appreciate it! Hope this helps you all! Thank you so much again Barb for helping me! You Rock! Happy Sunday morning to you Gentleman Jim! I'm a little late to your Halloween decorating party, but never, ever, will anyone complain about my decorating for every holiday again! I bow to your collections and imagination! I love Fiona's bike! I wish we could come up with a Fiona witchy title for your rider, but I can go with Broom-Helga! I love the crepe paper and cards with clothespins on the front wheel -- yes, we did that for parades and our birthdays! I love your stuffed figure -- I agree, they aren't really dolls. I bought one from an artist - a leprechaun - I LOVE him! He sits in my library overseeing readers year round! I also LOVE your pillow switch up! I've been looking around for some of the burlap ribbon, to no avail - next stop -- largest fabric store in the area. Yes, the entire DC area! I think it is just the right touch and for me, just sacreligious enough for my formal living room! :) You rock GC! That was supposed to read SVG, auto corrected. Thank you so much, your bats are just so darn cute! Funny, creative and very generous! Thank you Jim, you rock! going batty Sir Jim, I thought you were already batty lol. Keep up the great creating. Where is the svg files ? The link is for file in .pdf. A mistake ? I love the bats...if you hot glue a cloths pin to the back you can clip them on curtains and other objects...I have done that before and they are really cute that way. Just a little something extra...like you need anything else added to your crafting list.